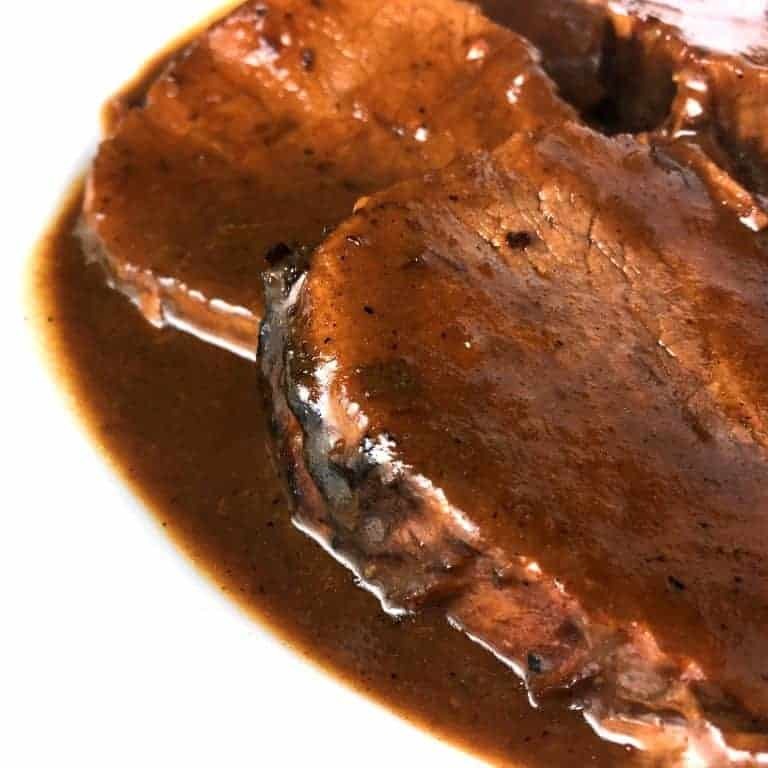 One of Germany’s national dishes, this authentic Sauerbraten is marinated, cooked until tender, and served with a wonderfully rich and flavorful sweet-tangy gravy! Serve it with homemade Rotkohl and potatoes, Knödel or Spätzle and you’re all set for a memorable feast! Growing up in southern Germany until my mid-20’s, Sauerbraten was a dish I always looked forward to. 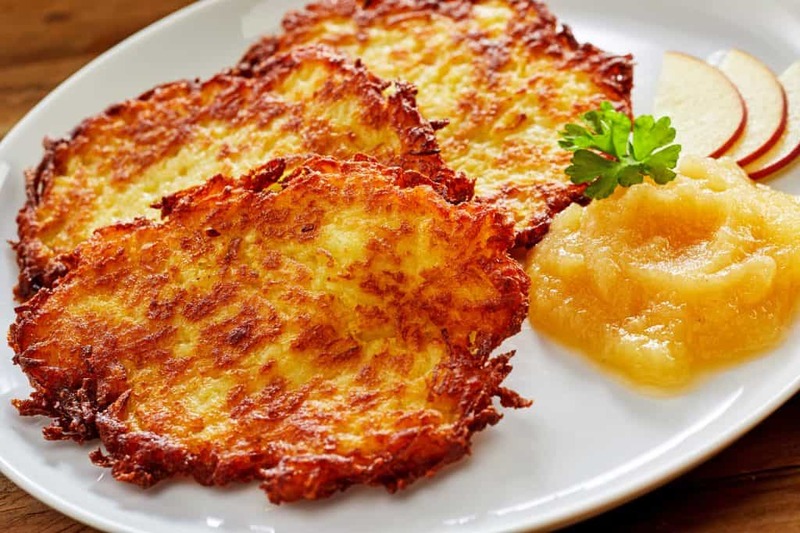 Both my German mother and my Oma would make it served with Rotkohl, Knödle and potatoes, sometimes Spätzle, and it was a memorable feast every time. It was also a dish we loved to order at restaurants. Wherever we went it was made a little differently, but always delicious. Sauerbraten recipes vary by region, each adding their own touches. Some regions use just vinegar, some just wine and others use a combination of both, which is the most common. There is always the addition of a sweet ingredient to balance the acidity and sourness of the sauce and some regions do this by adding ginger snap cookies, raisins, sugar, honey or sugar beet syrup (or often a combination of them) to achieve that balance. The addition of ginger snaps also serves to thicken the gravy. The origin of Sauerbraten has been ascribed to Julius Caesar who is documented as having sent beef marinated in wine all the way from Rome to the new Roman colony of Cologne. Saint Albert the Great of Cologne was later credited with having popularized the recipe in the 13th century. Originally the dish was most commonly made with horse and there are a few restaurants that still serve it, but today it’s primarily made with beef. Sometimes it’s also made with venison or lamb. This quintessential German dish is found on the menus of many German restaurants both in and outside of Germany. It has been one of Germany’s most popular dishes for generations and as such has become one of its official national dishes. 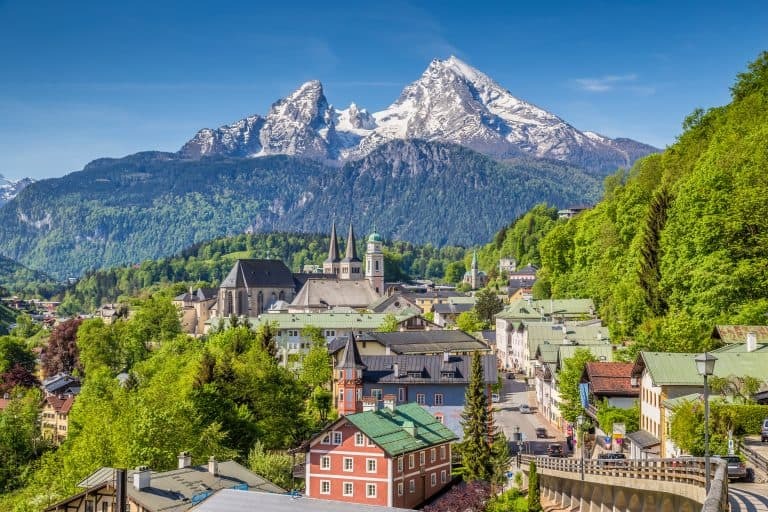 Beautiful Berchtesgaden in Bavaria, a favorite family vacation spot while growing up in the Swabia region of Southern Germany. 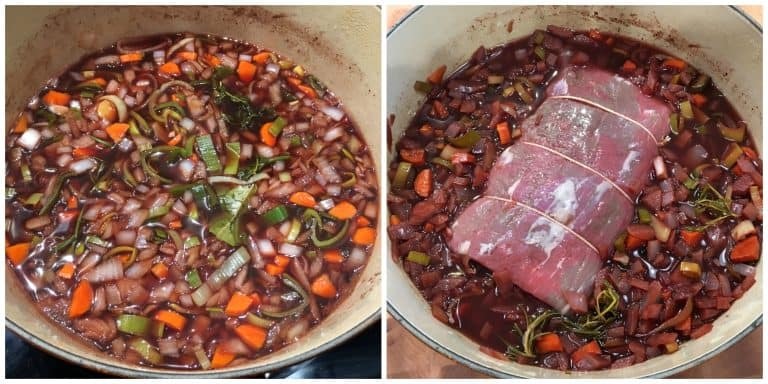 Sauerbraten is a dish that definitely requires some advance planning as the roast has to marinate for about a week before it’s ready to cook. Don’t cut corners by shortening the marinating time. Let the meat marinate fully and then reap the rewards for your patience! Ready to make some Sauerbraten? 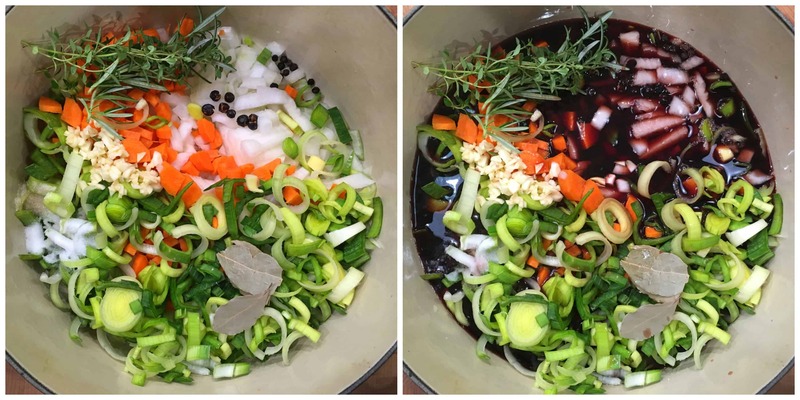 Place all of the veggies and herbs in a heavy stock pot or Dutch oven along with the garlic, juniper berries, whole cloves, bay leaves, salt, sugar and peppercorns. Add the red wine, red wine vinegar and water. Bring the mixture to a boil, reduce the heat, cover and simmer for 10 minutes. Turn off the heat and let the mixture cool down completely. Nestle the roast in the vegetable marinade and place the lid on the pot. Remove the roast and strain the liquid from the vegetables. Reserve the vegetables. Rinse the pot out and heat a tablespoon or two of oil in it over high heat. Generously brown the roast on all sides. Remove the roast and set aside. If using bacon, fry the bacon until done. Leave about 2 tablespoons of the oil/fat in the pot. Place the strained vegetables in the pot (along with the bacon if using) and cook for 5-7 minutes. Stir in the flour, cooking the mixture for a minute or two to eliminate the flour flavor. Add the liquid that you strained from the vegetable marinade, bring it to a boil, stirring constantly to prevent lumps. Important Note: The longer you let the roast marinate the faster it will cook because the meat will be more tender from the start. So check on your roast periodically for doneness. When the roast is done, remove and transfer it to a plate and let it rest for 5 minutes before slicing. In the meantime, strain the gravy. 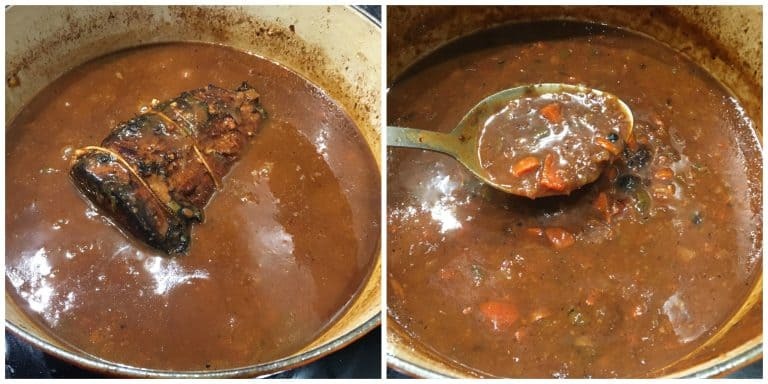 Strain the gravy and return it to the pot. Taste and more sugar, salt and pepper as desired. If you want your gravy thicker, make a cornstarch slurry to thicken the gravy. Note: The balance of sour to sweet is a matter of personal taste – adjust the flavor according to your preference. If the flavor is too strong for you, you can also dilute it with a little water or broth. 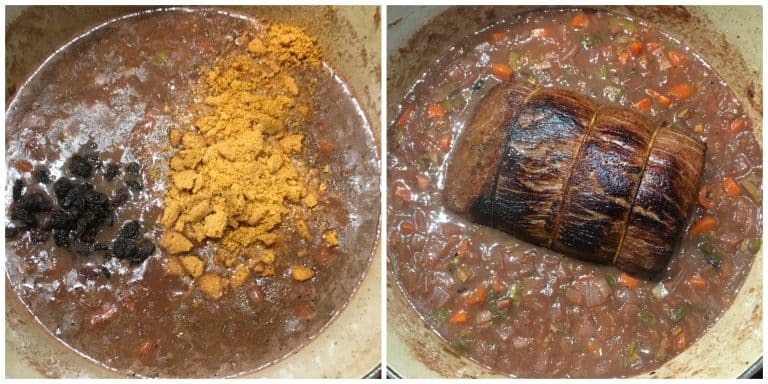 Let the roast rest for 5 minutes after removing it from the pot. Then slice the roast. Spoon the hot gravy over the sliced Sauerbraten and serve immediately. There are several traditional sides you can choose from. 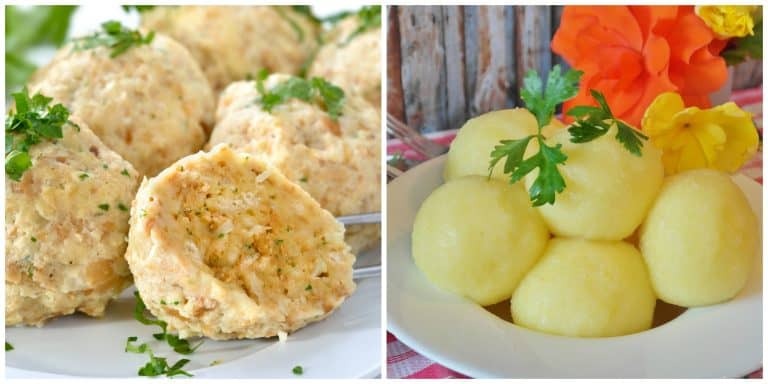 Besides potatoes, two of the most traditional and popular options are Semmelknödel and Kartoffelklöße. Grab the recipe for homemade Semmelknödel (German Bread Dumplings)! 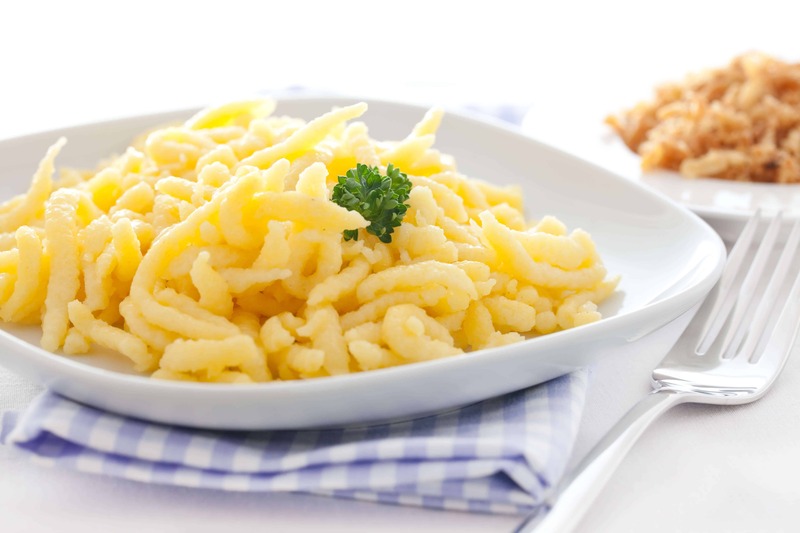 Another popular option is Homemade Spätzle. Some parts of Germany even serve Sauerbraten with these Homemade Kartoffelpuffer. 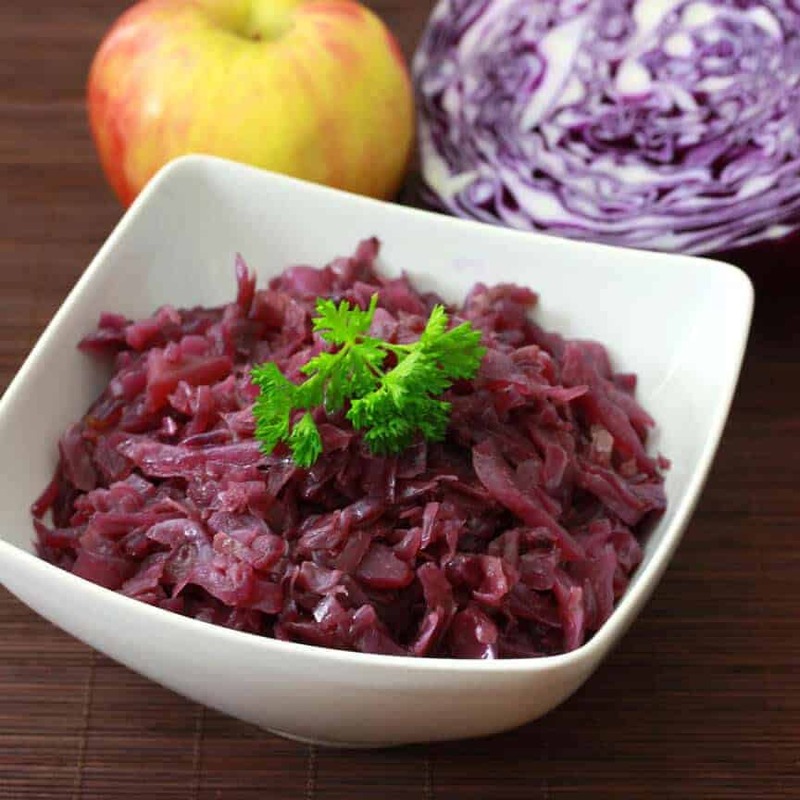 And you most definitely need to serve Sauerbraten with Homemade German Rotkohl – it’s tradition and it’s a must! 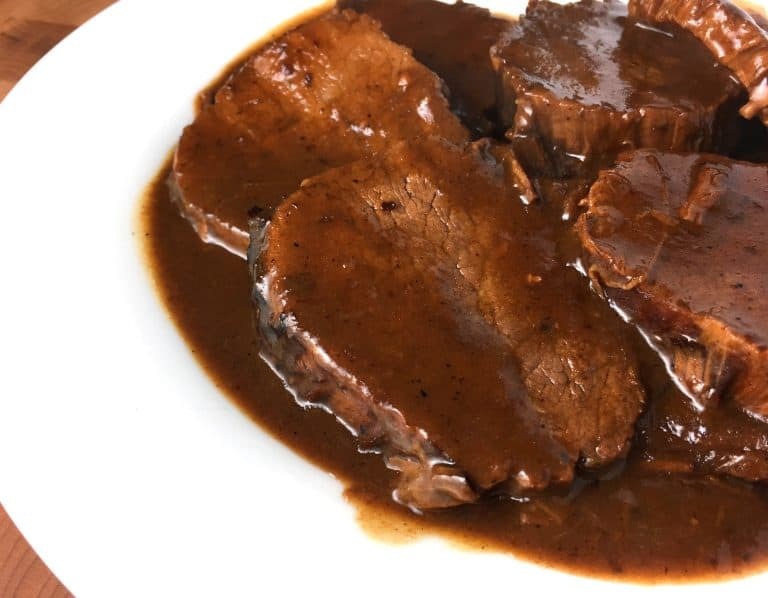 One of Germany's national dishes, Sauerbraten is a tender beef roast that has marinated for several days prior to cooking and is served with a wonderfully flavorful, and sweet-sour gravy. Serve with Homemade German Rotkohl and boiled potatoes, Homemade German Spätzle, Semmelknödel or Kartoffelklöße . A few parts of Germany even serve it with Homemade Kartoffelpuffer. This looks incredible! How fun to grow up in Germany! I’m so glad I found a recipe that tastes just like the sauerbraten we had in Germany this summer! 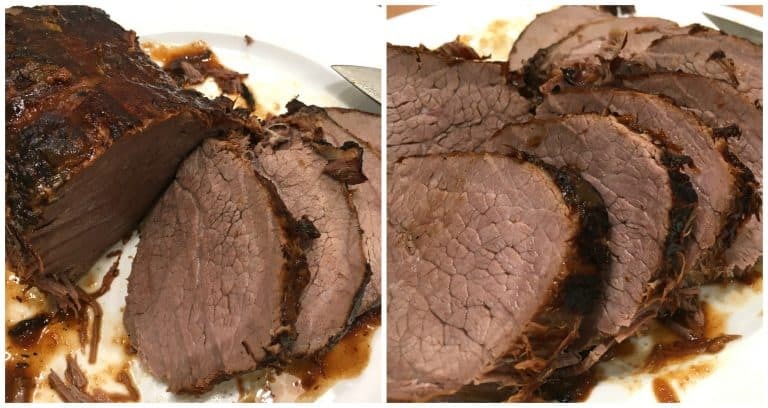 My frist experience with sauerbraten was when I worked at a country club while in college and that chef trained in Germany, and this looks like it is exactly how he would make it and how he showed us to make it. Nice job! I’m glad to find your recipe, and will have to give it a try. It’s different than my Mom’s (I’m in my 70’s), and she never wrote it down for me, but told me how to make it. My family, especially my husband like it, but I reserve the work involved for around a holiday. Some of the ingredients she did or did not use, may have been due to availability or cost at the time. I know she used onions, no raisins, juniper berries or honey. She was from around Wangen. When I asked her (about 50yrs ago) how to make the red cabbage, she said, “I got modern, and buy it in the store. They make a good product and it’s too much trouble to make.” She always served with the kartoffel klase. I’ll have to try your potato pancakes, too. My Dad made great ones, and I’ve never come close. Thank you for posting these!! Great memories of my childhood. Still hope to make a trip to that area, and also Neuenkirchen where Dad was from. I have never tried this but always been so curious. 100% making this! My husband will be delighted with this recipe! It is really impressive. Looks very tasty. Thank you for sharing this great recipe. Oh yum! I love everything about this recipe, looks fabulous and flavorful! This looks really flavorful! I would love to give it a try! Until I can make it to Germany I will have to cook recipes like this. It looks amazing! Beautiful photos! SO flavorful!! Thank you for the recipe – makes me want to go to Germany! Looks delicious! Never had this before, so will need to give it a try! This is great for Octoberfest! Such an authentic dish to celebrate. This authentic recipe looks like a labor of love but so worth it! Yum! I love all of your German recipes. I bet my husband would love Sauerbraten! This dish looks incredible! I am excited to try the side dishes too! Looks awesome! Such amazing flavors all in one dish, side dishes looks perfect! WOW! I have never heard of this before – can’t wait to try it out! Wow how awesome to grow up in Germany! This dish looks so good! Hi Kimberly – thank you for the recipe. I’m looking forward to trying it. Just a quick question – What type of red wine do you use? Hi Mike, I’ve used a variety of red wines for Sauerbraten and other beef dishes over the years including burgundy, merlot, pinot noir, red zinfandel, cabernet sauvignon, sangiovese, and cabernet Franc – all of them with great results. I’m no wine aficionado but in my opinion you can’t go wrong with any of those options. Love your column! Been following along for awhile and can attest to the authenticity of your recipes; my parents are both from Germany and immigrated to the US, so I grew up with German cooking. For sauerbraten, we have always marinated the meat in buttermilk (with some juniper berries, bay leaves and peppercorns) for 3-4 days, and discarded the buttermilk once done marinating. Then the recipe was pretty much the same as yours, as far as braising the veggies with the meat til tender, etc; never did use any gingersnaps or honey… Of course none of this was written down – all in my head now, since I learned to cook this food from my mom! Keep the recipes coming and thank you! On our first visit to my cousin’s village of Pfullingen, this is exactly what she prepared for our first German dinner after the long journey from SeaTac to Frankfurt and then on the ICE to Stuttgart where they met us and the hour drive to their haus. Fell in love with this meal and am already imaging how good this will be. By the way she makes what I believe is Semmelknödel from rolls I believe called Brotchen that are cubed and dried. The flavor and texture reminded me of a very good Thanksgiving dressing. Will be making this soon as fall has arrived here in the PNW. Lol, Gudrun, I can imagine! :) But yes, the effort is always worth it. And fried leftover Kartoffelklöße is a fabulous idea, thanks for sharing! Please add the name of the dish and your name to your pics, it’s hard to recognize things after a few weeks. Hi Judy, I’m not sure I understand what you mean, can you be more specific? This far exceeds my cooking skills, but just reading through the recipe brings back so many fond childhood memories. I love your website! I just realized that I haven’t made this in a million years! It’s so good. Thank you for the reminder. Germany is beautiful. Seems like when I was visiting I ate a lot of beautiful trout, although I sampled all of the local foods as well. I had so much white asparagus with schinken and white sauce… spargele? It’s a lovely country. Friendly greetings to Scotland, Bob! Wonderful, I hope you enjoy the fully “from-scratch” version and look forward to the feedback! Very good my German mother used buttermilk instead of wine so much milder Sorry. I haven’t had Sauerbraten for soooo long. This looks like the recipe I need to make NOW! Your site is excellent, pictures, descriptions, recipes. This is one I want to try. beef that shreds, like say for an Italian sandwich. 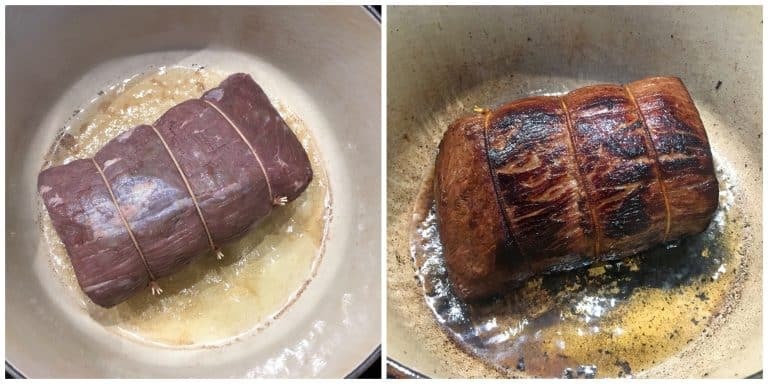 My question is what would you think if I followed your recipe through the browning of the roast and then cooked it sous vide to around 135F? Curious. Thanks for any comments. Hi Jim, sous vide is a fabulous method to use for meat, including roasts. My concern is for the gravy and the fact that it won’t be able to benefit from the long simmering time with the roast in it. That’s a large part of what gives the gravy its flavor and it will suffer greatly without it. Since the gravy is a central star of the Sauerbraten show, I would recommend sticking with the original method for this particular dish. Just wanted to let you know that I’ve had this marinating all week and will be preparing it for Sunday family dinner tomorrow. I can’t wait to try the end product tomorrow. Will let you know how it turns out! That’s exciting, Tim, I look forward to your feedback! Auzgezeichnet! The first bite and I knew I had a winner. Kimberly, I haven’t tasted Sauerbraten like this since I was in Germany. What an experience. Absolutely delicious. I thank you for sharing this. My wife and I thoroughly enjoyed this as did our family who joined us. Thank you. Thank you. I’m so thrilled to hear that, Tim, thank you! 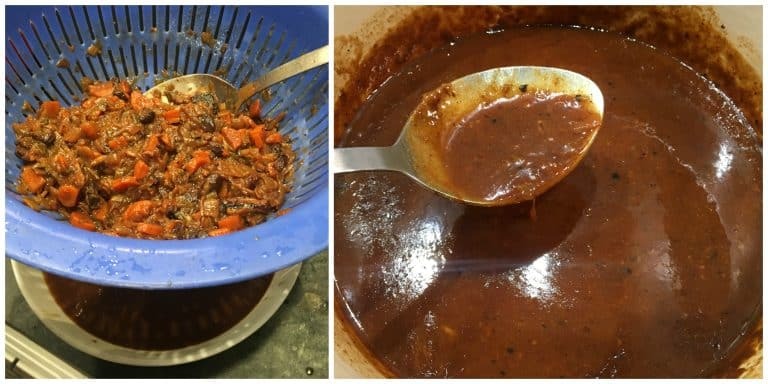 Cooked this yesterday, 21 October 2018 after marinating 8 full days. I omitted the optional bacon and substituted gin for juniper berries. Turned out absolutely delicious! The aroma filling the house as it cooked was great! Wonderful, Cynetta! I’m absolutely thrilled to hear that, thanks so much for the feedback! Loving your blog. I have a question on this Sauerbraten recipe though, I’m making g the marinade now and I’m noticing that the ingredient list calls for 1.5 cups of water but unless I keep missing it, I don’t see when to add it in the instructions. Does it go in the marinade? Thanks, Moggy! Yes that’s right, it’s included in the marinade. Thanks for catching that. I’m so happy you enjoyed it, Henry, thank you! limit, so I marinated the roast for 14 days. Just the aroma in the refrigerator and the daily exercise of turning it once a day was fun. It was absolutely delicious. There was enough gravy left over to freeze, and we still eat it on mashed potatoes. I am so thrilled to hear that, thanks so much for the feedback! WE WERE TOTALLY BLOWN AWAY!! Kimberly, I have been thoroughly impressed by every recipe of yours that I’ve tried. This one is yet another major winner. 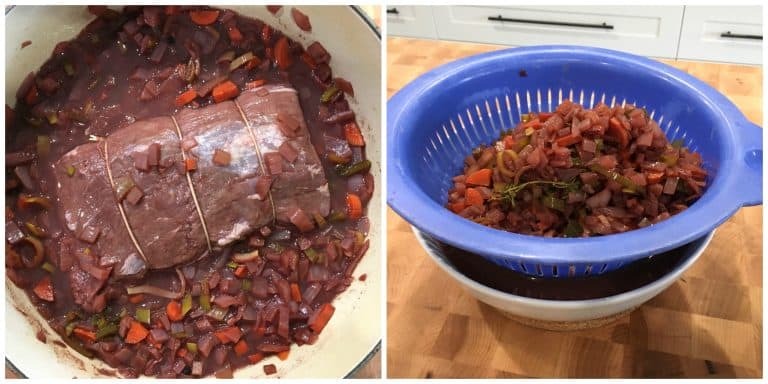 My husband and I spent a few years in Germany and I’ve been looking for an authentic Sauerbraten recipe ever since that successfully replicated the ones we ate overseas. I made yours exactly as written and it was DELICIOUS! This is the real deal. Thank you so much! Fantastic, Natalie, I’m so happy to hear that, thank you! I would like to cook this in a slow cooker. How many hours would it take for a 4lb roast? Hi Sue, I’d say plan on 8-10 on low or 5-7 on high, checking it sooner for doneness. Happy cooking! We made this roast on New Years Day after marinading it for 5 days and we loved it. Definitely adding this to the recipe books. Unfortunately we didn’t have juniper berries so we left that out along with the raisins but it still turned out awesome. That’s wonderful, Brandi Jo, I’m so glad you all enjoyed it, thank you! I always add a crumbled slice of Pumpernickel to the gravy. Born in Dresden, East Germany. The best sauerbraten I have EVER made or EVER eaten, thanks! That’s fantastic, Debra, I’m so happy to hear it, thank you! I made this tonight to absolute raves. It was soooo good! I only did two things differently, I did a 7 day marinade (easier to prep one weekend and cook the next) and I did the final cooking in the oven instead of the stovetop. Thanks for such a great recipe. And I made the Rotkohl too..wow was that amazing. That’s fantastic, Jen, I’m so happy to hear that, thank you! I was fortunate to be stationed in Germany many years ago. Authentic German cooking became and remains a favorite and I look forward to cooking this recipe. Thank you for this site. Thank you, Albert, and I hope you enjoy this and any other recipe you try on our site!